Chart of the month - How to assess the risk of an equity portfolio today? Chart of the Month – How to assess the risk of an equity portfolio today? How to assess the risk of an equity portfolio today? Calculating the beta has traditionally been a good way to assess the risk associated to a stock in a portfolio. The beta measures the sensitivity of the stock price to a market index. The higher the beta, the higher the amplitude of the stock price with the market on both long and short sides. In theory, having a portfolio of low beta stocks should protect you more in terms of downside during a market correction. The issue is that, as shown in the table above, the 5 Year Trailing Beta for most sectors has significantly changed over the last 3 years. With technology disruption in action in almost all parts of the economy, some companies which belong to defensive sectors are now more vulnerable with less strong barriers to entry. Healthcare and Consumer Staples have seen the highest increase in terms of beta whereas Telecommunication Services appear as among the less risky sectors to invest in today! The reality is that beta is only one statistic to look at and other parameters like factors and styles have more explanatory power to performance today. Momentum was the best performing factor by far until the last quarter of 2018 which saw a huge reversal. 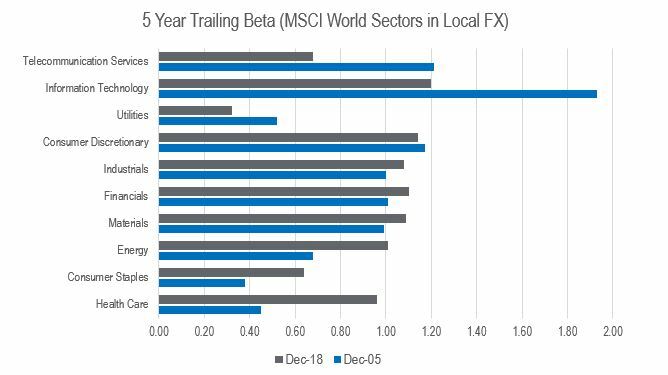 To make the story even more complex, the beta of factors are also less stable over time and record factor correlation explains the poor returns of quantitative and risk premia managers last year. At Notz Stucki, we are well aware of factor exposures and correlations when managing our equity portfolios. But the first question we ask ourselves when we analyze a company is do we want to own this business and is it able to generate good long-term compounding returns over the years.